What's that old cliché? Baseball will break your heart. "Today it is disappointing to make one bad pitch, but they played a great game, too," said Hill. "They pitched their tails off, and you can't discredit that." This Day in Dodgers History: In 1960 Vin Scully famously had fans at Dodger Stadium wish third base umpire Frank Secory a happy birthday during the game. In 1975 Davey Lopes stole three bases against the Expose to extend his Major League record of consecutive steals to 38. Then in the 12th inning of this same game he is thrown out at second base by Gary Carter. Coincidentally, Carter had been the last catcher to throw Lopes out before starting his record streak -- on June 4th. In 2007 the Dodgers signed free agent pitcher David Wells. In 2014 Joc Pederson became only the fourth player in the history of the PCL to have a 30-30 season, and the first to do it in 80 years, when he stole a base for the Albuquerque Isotopes (a Dodgers Triple-A affiliate). He would come up to Los Angeles later that September. 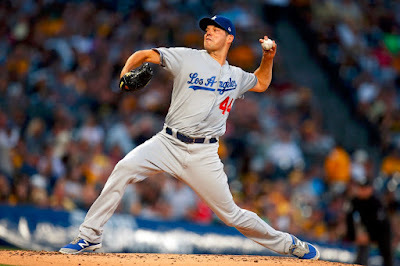 Happy Birthday, John Brown, Kip Gross, Jeff Kubenka, Kevin Correia & Enrique "Kiké" Hernandez! Per Matt Kelly and Chad Thornburg at MLB.com; "A look at the numbers in Hill's historic outing." According to Elias Sports, Harrison's blast marked the first time in history that a no-hit bid came to an end on a walk-off home run. In 24 combined appearances (19 starts) this season with Single-A Rancho Cucamonga, Double-A Tulsa and Triple-A Oklahoma City, Buehler has a 3-3 record with a 3.36 ERA (31 ER/ 83 IP) and one save, striking out a combined 117 batters against just 29 walks. Buehler started his season dominating the California League, posting a 1.10 ERA (2 ER/16.1 IP) in five starts, before his promotion to Tulsa on May 10. Ruiz began 2017 by slashing .317/372/.423 in 63 games for Single-A Great Lakes and was promoted to Single-A Rancho Cucamonga on July 9. With the Quakes, Ruiz is batting .353 (41-for-116) with six homers, six doubles, 25 RBI and 22 runs scored in 29 games. In 192 career minor-league games, the switch-hitting catcher has slashed .337 /.379/.473 with 11 homers, 52 doubles and 116 RBI. 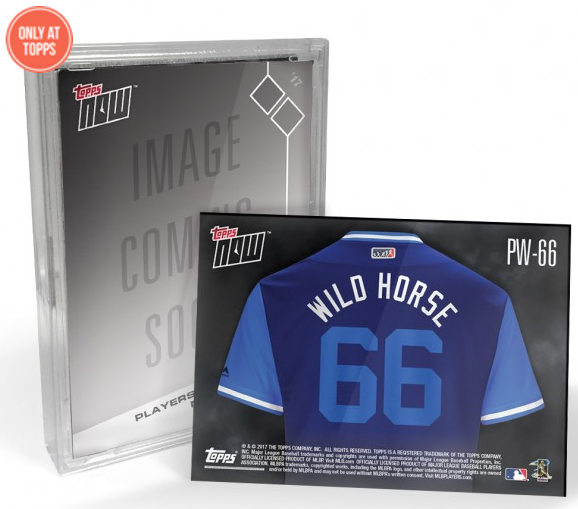 As part of the 1st "Players Weekend" Topps is issuing a limited run of Players Weekend five-card Topps Now sets for each team. The Dodgers checklist includes Yasiel Puig, Corey Seager and Kenley Jansen. The remaining two players have yet to be determined. 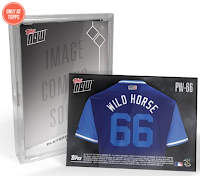 Furthermore, a 6th bonus card will be created if the Dodgers record a six game winning streak from Aug. 22nd through the end of the regular season. Go here to check it out and order. On the right is an example of what the cards will look like. Per Harold Uhlman at Think Blue LA; "Justin Hoyt named Pioneer League Pitcher of the Week." During the week in which he was selected as the Pitcher of the Week, Hoyt made two relief appearances over five innings in which he struck out nine while allowing one walk and one hit. He has now struck out 27 in 19.2 innings but has yet to appear in a save situation. That may change as the Raptors enter the last 18 games of their 2017 regular season schedule.